Plaza Mayor and Puerta del Sol are located in the heart of Madrid. These plazas and the surrounding streets and alleys are full of restaurants, bars, and shops. With popularity comes people, and you’ll find plenty of crowds and tourists in the area. Despite the crowds, neither plaza felt too touristy or over-commercialized, although one exception might be the street performers that gravitate here. The best way to enjoy the area is to grab a table in the shade and people-watch while you indulge in some delicious food and drinks. On New Years Eve, crowds gather in Puerta del Sol to ring in the new year. When the clock strikes midnight, it is a tradition to eat one grape with each of the twelve chimes of the bell — a way to ward off evil spirits and to bring good luck for the upcoming year. The Royal Palace of Madrid is the official residence of the Spanish Royal Family; however, it is only used for formal ceremonies. The Royal Family’s permanent residence is in a second palace on the outskirts of Madrid. The original palace was built in the 16th century, but was destroyed in a fire in 1734. The current palace was built in its place shortly thereafter. The Royal Palace is the largest palace by floor area in Europe, and each of its many rooms is beautifully decorated with intricate wall and floor coverings and period furniture and artwork. Photography was not allowed inside of the palace, but you can get a good idea of how beautiful it is with a quick Google search. My favorite part of the palace is the Royal Armory which contains armor and weapons worn by knights from various times in history. Madrid is a city of art, and three of the its main museums, known as the Golden Triangle of Art, are located within a short walk of each other. The Prado Museum features pre-20th century art, and includes masterpieces by famous artists such as Goya and Velázquez. The Reína Sofia museum features modern art, and contains works from some of the contemporary masters in Spain including Picasso, Dalí and El Greco. Picasso’s Guernica is the jewel of the Reína Sofia. The third museum, the Thyssen-Bornemisza Museum, is a private museum and contains a mixture of historical and modern art. 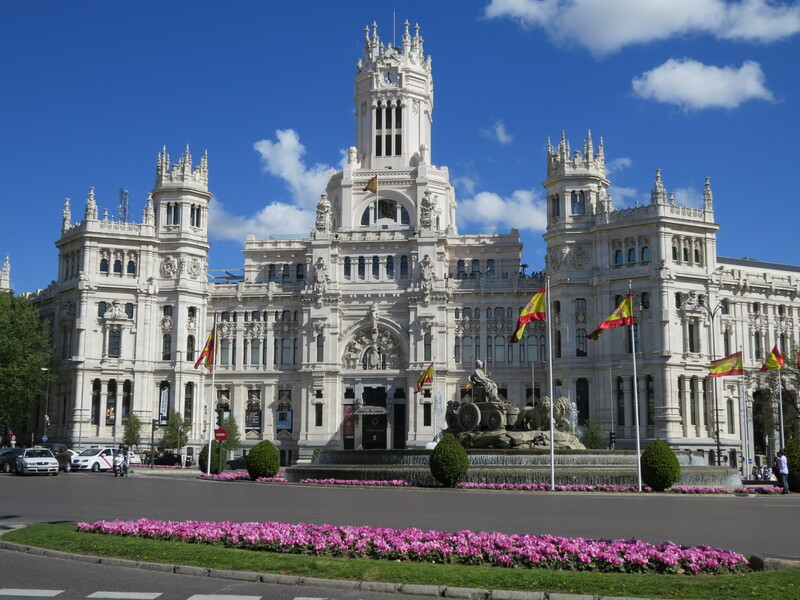 Madrid’s main train station is across the street from the Reína Sofia, and the other two museums are only a short walk away, so it is convenient to visit one or more on your way in or out of city. The Temple of Debod is an Egyptian temple dating from the 2nd century BC. In the 1960s, the construction of the Aswan Dam in Egypt threatened several temples, including the Temple of Debod. Spain provided assistance in preserving the Abu Simbel temples, which were also threatened by the dam, and in recognition for its help, Egypt gifted the Temple of Debod to Spain. In 1968, the temple was moved to a park in Madrid close to the Royal Palace, and it was opened to the public in 1972. Three other cities — New York, Turin, and Leiden — also received temples from Egypt at the same time. I loved the food everywhere I went in Spain, and the food in Madrid was no exception. Prices were a lot higher in Madrid than in Andalucia, but they were still reasonable compared to many other European cities. I had fun trying out some of Spain’s signature foods — Iberian ham, cheese, paella, and of course a beer to wash it all down. Two foods that Madrid is specifically known for are churros with chocolate dipping sauce and calamari sandwiches. My sister and I stopped at San Gínes to sample their churros. San Gínes has been around for over one hundred years, and it is widely popular, as any Google search will show. The place was full of travelers (the largest concentration of Americans I found in Spain) but it still felt authentic and the churros and chocolate sauce were excellent. You can find restaurants selling calamari sandwiches all around the Plaza Mayor area. I stopped in a random shop to try one out. At first I thought it might be a little too dry since it didn’t have mayonnaise or any other dressing on it, but the warm bread and calamari were actually quite moist. It felt wrong eating calamari on bread, but my taste buds had no complaints. In fact, just typing this is making me crave another one. Another interesting food location is Botín restaurant. Botín was founded in 1725 and has the distinction of being the oldest continually operated restaurant in the world. I didn’t eat there on my trip, but it would be worthwhile for those looking for a unique dining experience.